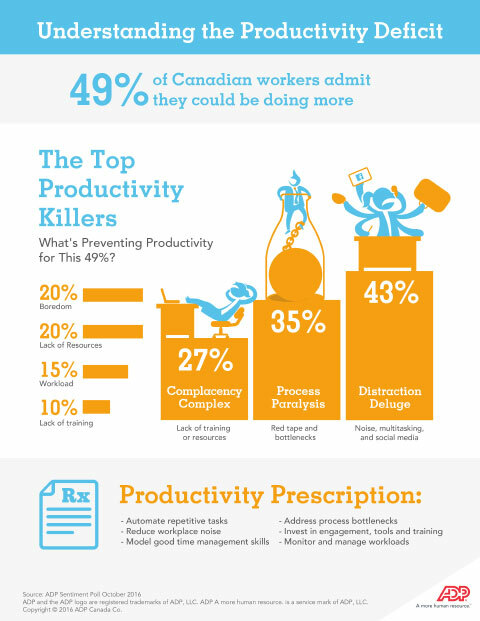 How Productive is Your Workplace? Everyone has those days. You start out with a list of things to do and the next thing you know, it’s time to go home and you haven’t checked off a single item. But what happens when everyday feels like that? 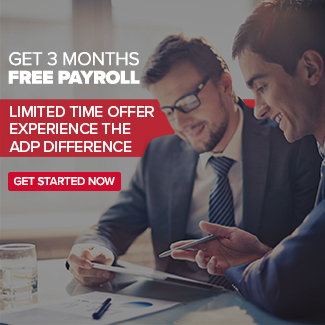 A recent ADP poll found that almost half of Canadian workers are less productive than they could be. This Productivity Deficit can be costly for employers and stressful for employees. The good news is, the leading productivity speed bumps are things employers can solve immediately, starting with distractions. From chatty co-workers to visual distractions and dinging notifications, 43 percent of workers say the Distraction Deluge is making it hard to concentrate and get things done. If distractions are a problem in your workplace, take a look at the design of the space itself. Is there a lot of noise? Is the space too crowded? Are there visual distractions such as TVs? Rearranging the space or encouraging your staff to stagger their hours or telecommute, might be the answer. Employees can also control some of the distraction by turning off email and text notifications, putting their mobile devices away when they need to focus and politely asking co-workers to save the conversation for later. The second leading cause of productivity deficit is Process Paralysis. Over a third of workers complain that cumbersome workflows, bureaucracy, red tape and organizational bottlenecks are slowing them down. 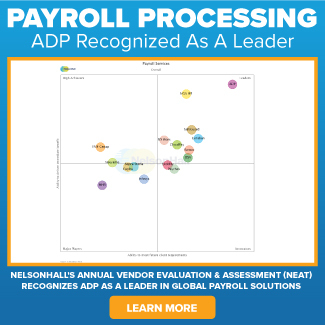 A quick survey of your team should reveal whether process is a productivity challenge, and if it is, you may find that automating repetitive tasks will help get things moving again. Other solutions include asking employees to redesign workflows and making sure everyone involved in a given process has enough bandwidth to move work along. Workload is another area to watch. Overloaded workers can create process bottlenecks, such as the ones above, but they can also find it difficult to focus on one task at a time to get things done. Managers should be checking in with their teams regularly to look for groups and individuals who may have too much on their plates. While all organizations have busy periods, there should also be enough resources to make sure the work isn’t piling up all year long. Speaking of resources, about 20 percent of workers say they lack key tools to get things done, and ten percent report they don’t have enough training. Another major cause of low productivity is Complacency Complex:. Over a quarter of workers say they know they could be more productive but they just don’t feel the need to find more efficient ways to get the job done. While it’s tempting to dismiss this as laziness, what it may reveal is old processes that haven’t been reviewed in a while. Over time, workers become more efficient as they gain experience and refine processes. Employers have an opportunity to find the tasks that simply don’t take as long as they used to, and to offer those workers additional duties. This improves productivity, and it can stave off boredom and lower turnover. With growing pressure in most organizations to do more with less, even minor improvements in your productivity can create better bottom line results and a more engaged workforce. How productive are you at work? What’s getting in your way? What are your productivity hacks?